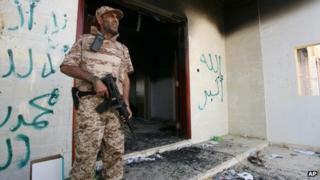 In Libya's second-largest city, Benghazi, residents have been reflecting on the attacks on the American consulate building on Tuesday. To many, the ferocity of the incident came as little surprise. They blamed rising extremism, lawlessness and uncontrollable militias for the worsening security situation in Libya, almost one year after the downfall of Col Muammar Gaddafi. On Tuesday, eight Libyans and four Americans were killed in the attack, including the US ambassador to Libya, J Christopher Stevens. The attack was apparently provoked by a film that mocked the Prophet Muhammad and was allegedly produced in the US and excerpted on YouTube with dubbing in Arabic. The circumstances surrounding the attack are not clear but it is believed that it was carried out by extremists. "The radicals are sweeping in the elections not only in Libya but in the so-called Arab Spring countries," fumed Essam al-Firjani, a 56-year-old civil servant. "They have armed groups here in Libya and they are trying to impose the law of the jungle on the overwhelming majority of moderate Libyans. We are the true voice of Islam." Mohammed Alwarfili, a 35-year-old Arabic teacher, said he saw the trailer of the controversial movie and was "deeply offended". "But there is no excuse to kill innocent lives. All Libyans really feel for the family of the ambassador of a country that helped liberate us from a dictator like Muammar Gaddafi," Mr Alwarfili said. Supporters of radical groups in Benghazi, such as Ansar al-Sharia, have taken part in the protests outside the consulate but distanced themselves from the attack. Ansar al-Sharia and other radical groups adopt a strict interpretation of Islam. More recently, they desecrated Sufi Muslim shrines and World War II graves. In June a convoy carrying the British ambassador to Libya, Dominic Asquith, was attacked in Benghazi, injuring two bodyguards. MP Saleh Assenousi, of the Muslim Brotherhood's Justice and Construction party, called the controversial movie a ruse. "A minority of Muslims fell into the trap of protesting violently," Mr Assenousi lamented. "Unfortunately such behaviour makes headlines and does more harm than good to a much stereotyped Islam. They have not learnt the lesson from the Danish cartoons," he added. In 2005, Danish newspaper Jyllands-Posten published cartoons depicting the Prophet Muhammad. One of them portrayed the prophet of Islam with a ticking bomb attached to his turban. The cartoons were deemed blasphemous by many Muslims and sparked protests mainly in Muslim countries. Some of the protests turned violent with Danish embassies in Arab countries set alight. Ibrahim Omran, a Benghazi pharmacist, says the governing officials should be held accountable for a "lawless" Libya. "The attack on the US consulate is a reminder of the country's worsening security," he said. "It is not the first and will not be the last in Benghazi". The city witnessed a series of car bombings and rocket attacks after the July elections, which were the country's first democratic and multi-party parliamentary elections in more than 40 years. Hind Alghamdi, a housewife, agrees: "The country is not secure and this is because of the countless of militias." Many militias refused to disarm after a bloody internecine conflict that ousted Col Gaddafi last year. Militia leaders have said that they must ensure first their local needs were met by a permanent government in the capital Tripoli. With weak police and national army, the transitional government has resorted to militia commanders to provide security in major cities and protect the country's oil installations and fields. "These militias were in the near past revolutionary brigades. Now they have become mafias," Mrs Alghamdi said.